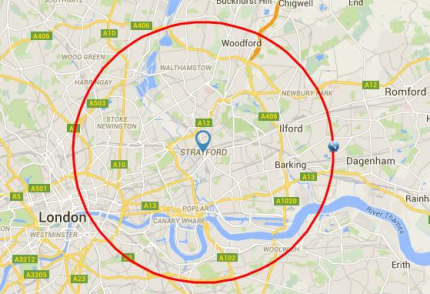 Door drop planning – distance or drive time or nearest? Distance, drive time or even “nearest to” briefs, are a crucial element of planning door drop campaigns for clients looking to support and drive traffic into their locations. Major High Street retailers are obvious major users of this type of planning, but it equally can apply to many other business sectors. Theatres, pubs, dentists, estate agents, health centres, zoos and wildlife parks, colleges and universities, hospices, vets, care homes, takeaways, the list is endless. And each client will have a different requirement or preference. In addition to which, clients with multiple locations may (or rather should) have different requirements or preferences for each. So just how do you decide what’s best for you? The best practice is don’t guess and don’t assume a plan you may have inherited is the most appropriate solution. Seek professional guidance and keep an open mind. Sometimes, the differences can be pretty obvious. A 5 mile radius of a central Birmingham location will produce a report with hundreds of thousands of households. By comparison, a 5 mile radius of Galashiels might not top 20,000. There may be a huge difference to a 20 minute drive time from central Birmingham, in comparison to 20 minutes from Galashiels. The AA route planner says my journey from home to junction 25 on the M25 will take 5 minutes; if only. Drive time software does not take heavy traffic into account. Conversely, if your location is close to motorway or main road networks, drive times may be distorted. So a 30 minute drive time may cover a far greater area than you would imagine. Don’t try to apply a one size fits all policy when planning door drops around multiple locations. Treat them as individual exercises. And as we have said in previous targeting posts, also apply local knowledge and existing customer data to demographic targeting rather than a general, broad brush, national approach. Local distance targeting, allied to bespoke demographic models, should be a winning combination. Think Birmingham and Galashiels again.